This article is a loose follow-up on our last episode Using Fibonacci lines (Strategy), so i recommend you to read it first, if you do not know how to trade using Fibonacci lines. Today I did not have much time for trading, but nevertheless i have made one trade for you, using the Fibonacci line method, as to show you how easy it is to find such trades. Trading USDJPY with the expiration time of 20 minutes. I drew Fibonacci lines (see Image 1) and just waited until the price approaches one of them. 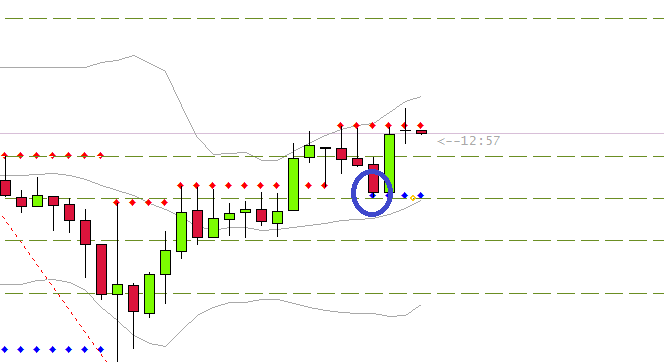 Then at 17:30 i have noticed what is happening to the price, i tensed and zoomed in on M1. (see Image 2) and at that moment i have invested on turnover (CALL). One more picture (Image 3) with timeframe M1, for you to see how exemplary turnover our price showed.